With the summer season still a month away and the weather warming up little by little each day, it’s the perfect time to plan for your summer – and that includes how you will stay cool and comfortable. If summer’s scorching temperatures, oppressive humidity, and glaring sun have you hiding indoors with the blinds drawn, then sun control window film may be the solution you need to enjoy this summer in comfort. Window film is a transparent adhesive layer that can be applied directly to your pre-existing windows. Sun control window films are specially designed to allow sunlight to pass through your windows and brighten your interior spaces, while simultaneously blocking out the undesirable effects of the sun. These films can be applied in both residential and commercial spaces. By applying sun control window film to your windows, you can enjoy natural light indoors without sacrificing your comfort. Sun control window films help homeowners and commercial property owners mitigate the unpleasant effects of the sun by providing 3 major benefits: indoor climate control, glare reduction, and UV protection. Large windows are a beautiful home or office feature, but they come with some downsides, including excessive heat gain in the summertime. 3M sun control window films help mitigate these problems by rejecting up to 97% of infrared light from the sun and blocking 60% of the heat that would otherwise come through the window. You will be able to enjoy the natural sunlight indoors without having to run the air conditioner 24/7, which translates to major energy conservation and savings on your utility bill. When the sun’s bright light reflects off of interior surfaces, glare is often the result. Glare from the sun’s rays reflecting from computer monitors, tablets, television screens, and mobile phones can be a particularly painful nuisance. 3M sun control window films reduce interior and exterior reflectivity, cutting glare by up to 76%. By mitigating glare with window film, you will be able to enjoy your windows instead of drawing the blinds. Your home’s exterior stays beautiful, and from the interior, your view is as clear as your original window. If you have large windows in your home, you may have noticed the powerful effects that sustained sun exposure can have on your hardwood floors, carpeting, and possessions. Window films help reduce the fading effects of the sun by blocking nearly all of the sun’s ultraviolet rays from passing through your window. 3M sun control window films reject 99.9% of UV rays, protecting your skin from the damaging effects of the sun’s rays. By blocking UV light, these window films also preserve your property by preventing fading of floors, furniture, drapes, and artwork. While conserving energy may not impact your physical comfort, it is an important environmental and cost benefit of sun control window film. By reducing reliance on heating and cooling systems to maintain a comfortable indoor temperature year round and by allowing natural light to illuminate interior spaces during the day, window films help homeowners to reduce energy use – and cut down on their utility bills. If you plan on spending the summer sequestered indoors with the air conditioning on high, then applying window film to the windows in your home may be a great solution. With sun control window film, you can enjoy the summer in comfort. 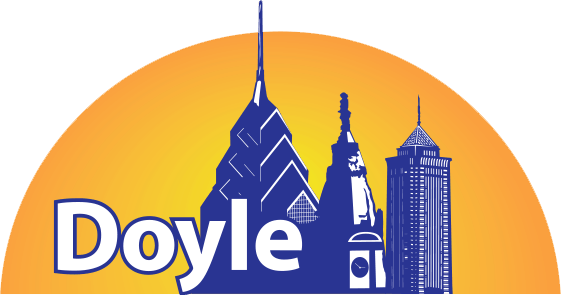 Doyle Window Tinting is the largest 3M window film dealer in the Delaware Valley. We are proud to provide our clients in the residential, commercial and government markets with window film products that meet their needs and exceed their expectations. To learn more about window film, or to schedule an appointment for a free estimate, give us a call today or get in touch using our contact form.